The Bishop of St Asaph has blessed the newly restored bells of Ruthin Church. 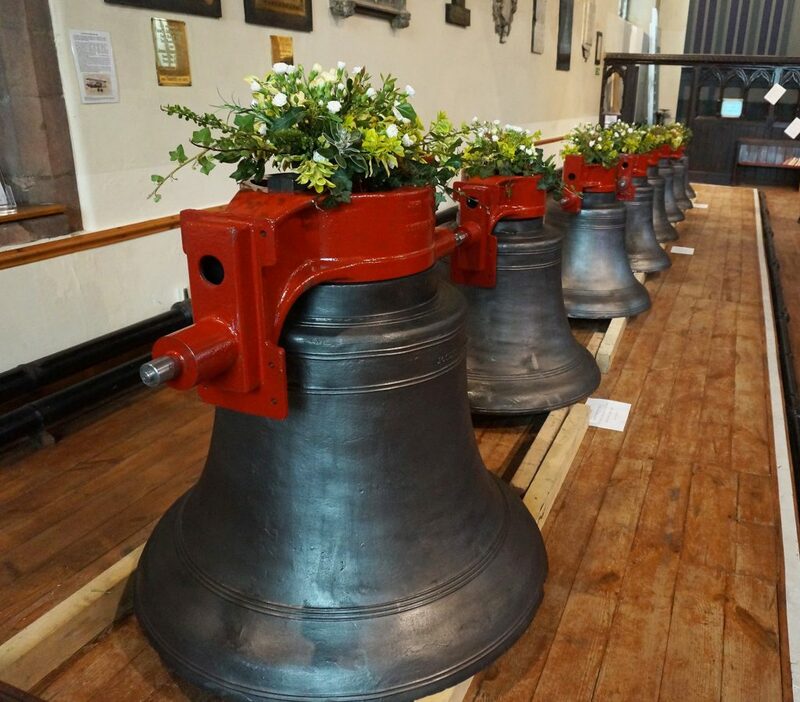 The eight bells, which have been cleaned and restored at the Taylors Foundry in Loughborough, were on the floor of the church and decorated with flowers for the “hallowing” service. The Warden of St Peter’s Collegiate Church, the Revd Stuart Evans said: “We are delighted to welcome the Bishop of St Asaph to our special service to hallow the bells. “It is common practice to ‘set apart’ or ‘hallow’ things used specifically for service in Christ’s Church. Unusually, bells may only be blessed by a bishop! “Bells mark time with bells ringing out with joy in time of celebration, as happened in the past to mark the cessation of war and happens today when a couple gets married. Bells also mark times of sadness, tolling at funerals or other times of local or national concern. For me, this marking of all times draws attention to Christ – the Lord of all time who invites us to use our time wisely – never being silent but in words and deeds ‘ringing out’ with the Good News of Christ! 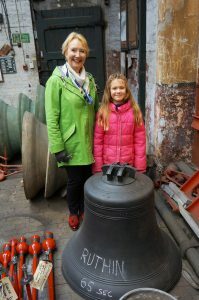 St Peter’s has received a £96,000 National Lottery award to carry out the restoration work which will see the eight bells placed into a new metal frame and the ringing room inside the church tower refurbished. Archives show that “a great bell” has been rung at St Peter’s since at least 1654 and by 1788 the church had a peal of six. These were replaced in 1843, funded by public subscription, and two new trebles added in 1889, to make a peal of eight. By the 1970s rumours that the church spire was structurally unsafe, stopped the bells being run regularly. Until last October, only the curfew bell was rung weekly, a reminder of its role in the medieval period when the town’s gates were closed at 8pm. Last month, the church ran a competition in the local primary schools to design a logo for the bells project. All the entries have gone on display at Ruthin Craft Centre, alongside an exhibition on the bell’s restoration so far. Three logos were selected as finalists in the logo competition and their young designers were invited to join a visit to Taylors Foundry in Loughborough by members of the congregation in February. The logos will be used as special commemorative cards to be given out after the service. Visitors to the exhibition at Ruthin Craft Centre are also invited to choose their favourite logo which will then be used for promoting the bell restoration project in church. The bells of St Peter’s Ruthin are expected to be hoisted back into the church tower later in the year. The service of hallowing takes place on Sunday (31 March) at 10.30am and everyone is welcome.